Watch full Ginga Eiyuu Densetsu Season 2 Episode 24 English Subbed full HD online. Ginga Eiyuu Densetsu Episode 50 English Subbed online for free in HD. Battle After Battle. Yang attacks the supply lines of the Imperial fleet successfully. Next, Yang defeats a fleet near a black hole. Reinhard’s anger at these losses are reaching boiling point. 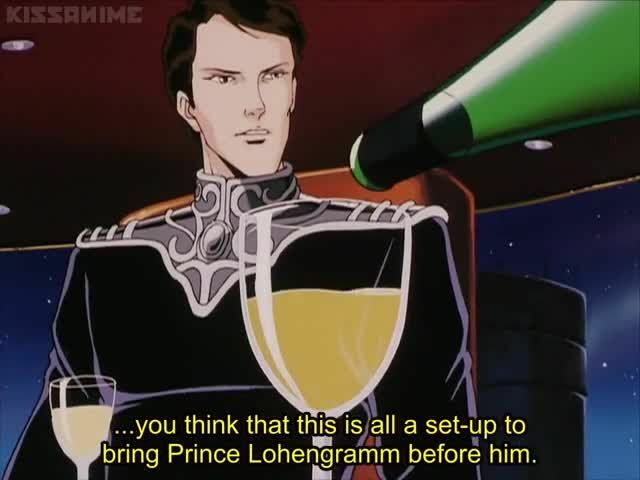 Mittermeyer and Reuenthal realize that they will have to launch a large offensive versus Yang if they hope to win before morale and food drops to dangerous levels. Yang defeats another fleet by filling supply pods with helium, then igniting the pods when the Imperial fleet nears them for pick up. Yang’s guerrilla warfare tactics leave the Imperial fleet with uncertainty on where Yang will appear next. An attack on Heinessen is vetoed by both the Imperial Admirals and Reinhard. The only remaining option is a full fleet encounter by using Reinhard as bait.